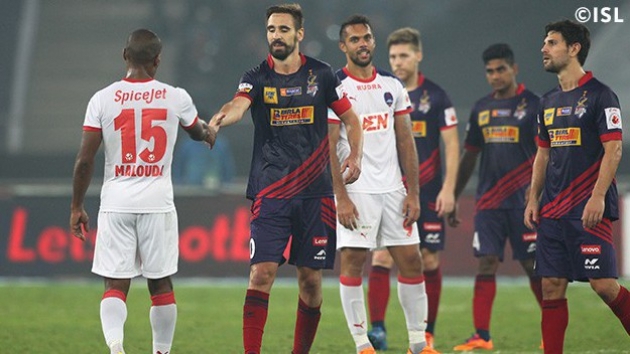 An 18,336-strong crowd at the Jawaharlal Nehru Stadium in New Delhi witnessed an action-packed Hero Indian Super League Season 2 match as Delhi Dynamos FC and Atlético de Kolkata played out a 1-1 draw on Saturday evening. Richard Gadze’s goal for the home team in the 61st minute cancelled out Iain Hume’s strike in the 27th minute. The match began on a sombre note as both teams observed a moment of silence for the victims in the Paris and Beirut terror attacks. After the game began, the first real chance came Delhi’s way as they came close to scoring in the 8th minute when an Adinga cross, directed towards a charging Robin Singh, was put away by ATK keeper Amrinder Singh.